There’s a ton of information floating around about social media, and it can be a bit overwhelming to someone who has run their business without it and is looking to dive in. What is it? how do I use it? Is it technical? Will it waste my time? Can I measure it’s effectiveness? What do I talk about? We’ve gathered a collection of articles, guides, books and service providers that can really help alleviate some of the fear and doubt involved. I’ve specifically chosen these resources because I believe they will help any REALTOR in any point of their business, from total newbies to seasoned vets. By far, the best book on the subject is written by fellow Canadian Scott Stratten. 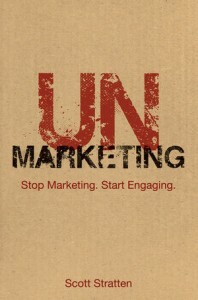 His book is called UNMarketing, and it shows you how to stop marketing (in the traditional sense) and start engaging with your audience. In the business of real estate, relationships are absolutely EVERYTHING. Social media is just another tool in your toolbox to foster relationships and build trust. We had a chance to sit down with Scott over dinner, last time he was in Vancouver giving a presentation, and one word of advice he gave to real estate agents was to stop using social media as a broadcasting system. You wouldn’t go to a cocktail party, stand on a chair and yell “OPEN HOUSE! THIS SUNDAY! FREE COOKIES!”. Twitter is the modern-day cocktail party… and it’s not meant to be a broadcasting system. I couldn’t agree more. I think the main point is to not only use it for this purpose. It’s okay to sprinkle in that type of message, as long as it’s not all you do, and try engaging your audience with a question. How would you tell a friend about your upcoming open house in person if you were sitting across from them at a dinner table? 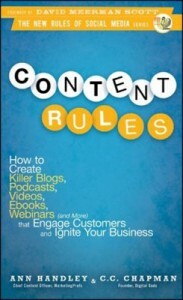 Another gem is Content Rules, by Ann Handley and C.C. Chapman. Blogs, YouTube, Facebook, Twitter, and other online platforms are giving organizations like yours an enormous opportunity to engage directly with your customers. That’s a lucky thing: because instead of creating awareness about your company or your brand solely the old-school way (through annoying people with advertising, or bugging them with direct mail, or interrupting them with whatever), you now have an unprecedented and enormous opportunity. Produce great stuff, and your customers will come to you. Produce great stuff, and your customers will share your story for you. More than ever before: Content is king! Content rules! Don’t have time to do it yourself? maybe it’s time to hire an expert.